This map indicates high historic sensitivity sites. Environmental constraints would include those historic buildings, structures, objects, sites or districts that have been listed in, determined eligible for listing in or are potentially eligible for listing in the National Register of Historic Places and the New Jersey Register of Historic Places. Until further research is conducted, any actions that would negatively impact these properties should be avoided if possible. I-295/I-76/Route 42 project area. Early colonial settlers to the Camden and Gloucester County project area utilized waterways to penetrate into the inland areas. Early farms and towns were developed in proximity to waterways for transportation, shipbuilding and shipping needs. Farmsteads relied on the inland waterways to transport agricultural products along the coast and overseas. Also, choice farmsteads were laid out with a navigable waterway bordering the estate. As industrial development settled into the I-295/I-76/Route 42 project area, streams and creeks were dammed to provide an energy source for fueling (wool), grain and lumber mills. Consequently, these are the types of historic archaeological resources that may be found in the project area. 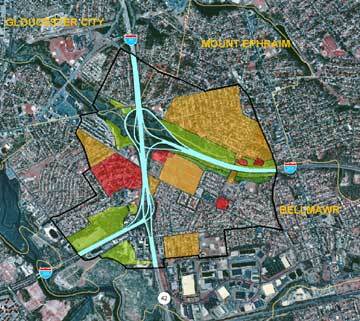 Archaeological sites with high and medium historic sensitivity comprise the environmental constraints for historic archaeological potential in the I-295/I-76/Route 42 project area.